Yoan Moncada had a fantastic outing in his first start in Spring Training. While he had been called up to play in the first game of Spring Training against Northeastern, he made his first start today at second base. In his first appearance, earlier this spring, Moncada impressed with his bat, going two for two with a double and a run scored. But today he impressed with his glove, speed and awareness in the field. Starting off the game, Moncada came charging in on a bunt that got past pitcher Joe Kelly, scooped up the ball and fired to first to beat the runner by a step. Moncada also helped turn two double plays today before being taken out of the game. While he went 0-2 at the plate in three appearances, he had three very productive at bats. In his second at bat he struck out facing Pirates closer Mark Melancon. His third at bat was his most impressive, falling behind 1-2 in the count before working an eight pitch walk. 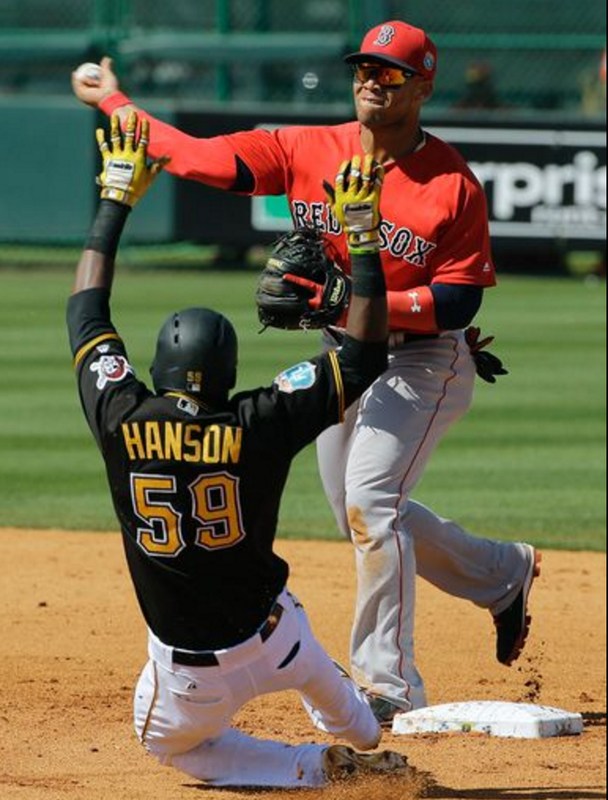 While on base he ended up coming around to score on a Pablo Sandoval double. After the game, both teammates and manager John Farrell were did not shy away from praising Moncada. Kelly said, "I underestimated him big time, he's quicker than I thought. Just because of how big he was, I was like, on plays like that [bunt play], just in my head I was like, 'There's no way he could get to them. And then the guy put down a swinging drag bunt, I just barely missed it, and he was there". Farrell said, "He was down in Fort Myers a good week or 10 days before our big league camp opened, so he's game ready". Moncada seemed happy to hear the praise and discussed it through his interpreter. He said "That makes me happy to hear, I'm honored my teammates think that way of me. I thank them for the opportunity to be here and play for them and take their advice, and it's just a blessing to be here in this organization". While Moncada is still years away from becoming an everyday player on the Red Sox, it seems like the 20 year old has things figured out. Every appearance he makes, makes the scouts look smarter on telling the Red Sox front office to invest heavily in this young Cuban star. From what you have heard about Moncada, are you impressed? He will be on to watch in the minor leagues this year, most likely in Salem and possibly in Portland. Let me know your thoughts about Moncada in the comments section or on my twitter by clicking here.